Biodegradable 13-Pocket Letter Size Expanding Files are made from acid-free polypropylene which contains an additional additive that allows it to biodegrade when tested according to the ASTM D5511. * Includes write-on tabs and button and elastic closure. 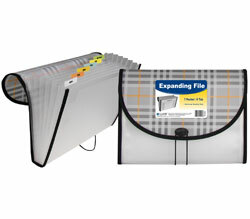 For 11 x 8 1/2 document storage. 13-pocket/12-tab size. Assorted colors include blue, aqua, purple, pink, smoke. Minimum purchase quantity is 12 units (one display). * Learn about ASTM testing and the time and conditions it takes for these products to biodegrade. Incidental parts (elastic string and button closure) are not expected to biodegrade.